Neon. LED. Channel letters. Wooden signs. Magnetic letters. Aside from dynamic digital signage, the “new media” in the sign industry is, strange as it may sound, print. 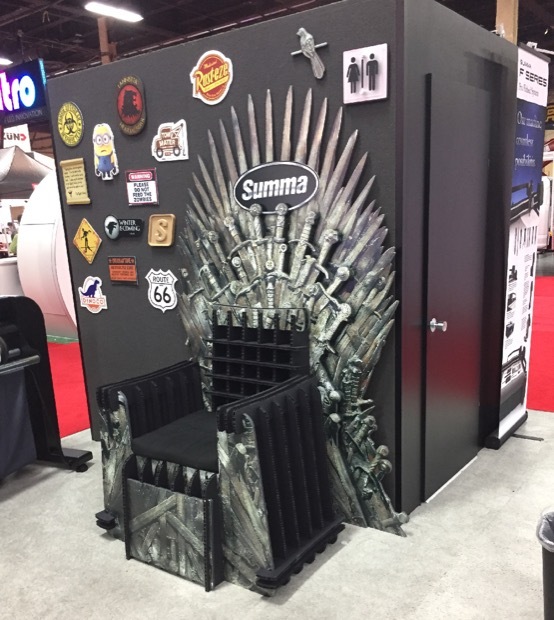 Or at least that’s the impression one got from this year’s International Sign Association (ISA) Sign Expo, which wrapped up on Saturday at the Mandalay Bay Convention Center in Las Vegas. The Sign Expo, perhaps more than any other major show, features a vast array of disparate technologies. Robotic arms on automatic-feeding cutting tables are stone’s throw away from crane trucks. 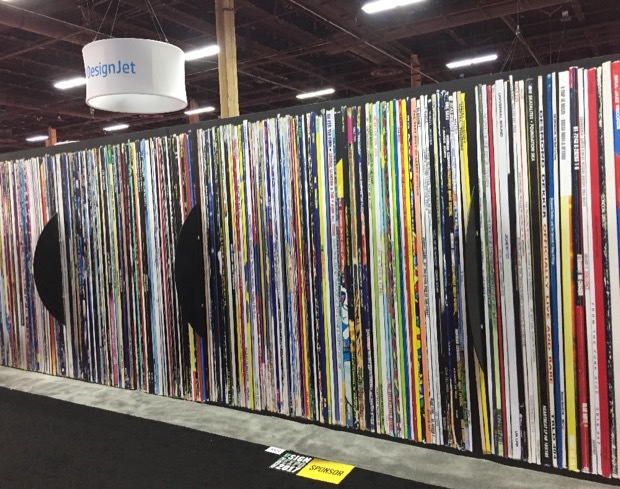 About half a decade ago, wide-format printing technology started taking the Sign Expo—and sign shops—into a print-focused direction. Just like commercial printers have been moving into wide-format and specialty printing, so, too, have sign shops been moving into other kinds of printing, even—dare I say—general commercial printing. The printing industry today is becoming a large Venn diagram of overlapping specialty markets and applications. Of course, it always kind of had been, only today the names we assign to the overlapping circles have changed. And shows like the Sign Expo—and of course industry associations themselves—have changed to reflect these dynamics. 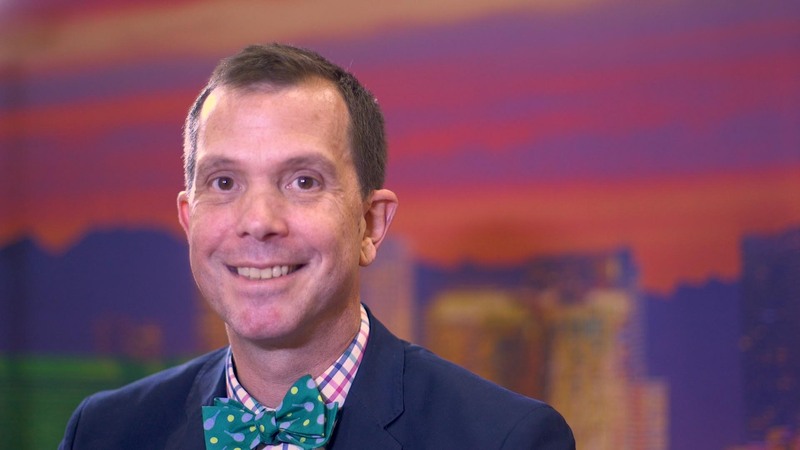 Educational sessions have been expanded to show signmakers how to get into transactional printing, just as other sessions tell commercial printers how to get into signmaking. As I pointed out in my Sign Expo preview article a couple of weeks ago, partnerships and colocations are becoming the rule rather than the exception. Case in point: the Collaboration in Packaging Production (CPP) Expo colocated with the Sign Expo for the first time, and on Wednesday afternoon, CPP sponsor Konica Minolta hosted a reception and “open house” that showcased its lineup of hardware and software for a variety of digital printing and packaging applications. 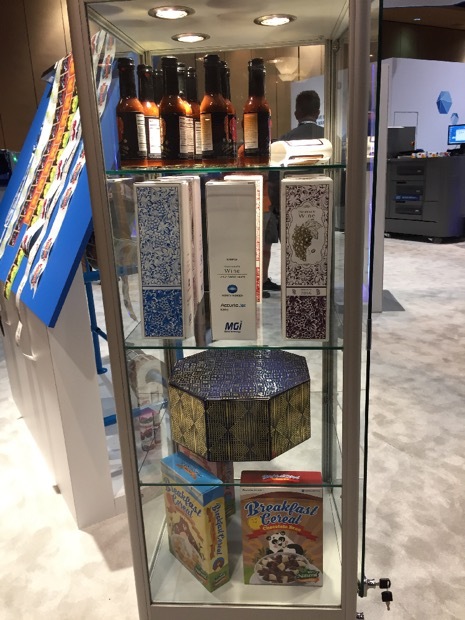 MGI, a partner of Konica Minolta, was showcasing its digital embellishment equipment, specifically the JETvarnish 3DW Dimensional UV and Digital Foiling systems, as well as a growing ecosystem for maximizing embellished output. Using Konica Minolta’s digital label printing equipment and MGI’s digital embellishment techniques, packages can distinguish themselves and stand out on a store shelf. One of the central questions that designers have about adding things like digital foil stamping is how to actually design for it and, perhaps more importantly, how to demonstrate (or proof) a 3D effect to clients electronically. 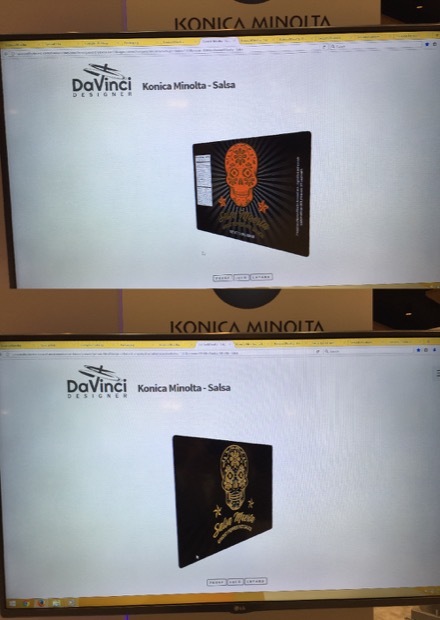 Enter Davinci Designer, cloud-based software that lets designers add textures and other embellishments (such as that which can be produced by the MGI equipment) and then generate rotatable, web-based 3D simulations that show clients what a foil-stamped label or textured card will look like. Even better, the 3D representation of, say, a label can be used on the client’s own website as part of a multi-/omni-channel marketing effort. With Davinci Designer, users can show clients a rotatable web-based representation of how a 3D effect will be rendered. A substantial part of packaging is labels, and Konica Minolta and its partners were also showcasing digital label solutions, such as the C71cf that allows not only printers but even brandowners themselves to take advantage of the vastly growing market for short-run digital labels. Not every brand—especially in this age of fast-growing craft and artisanal products—needs millions of labels; sometimes they need only a few thousand, if even that many. These kinds of short-run digital label systems hit the sweet spot that more and more small businesses need, and that large label printers won’t touch. 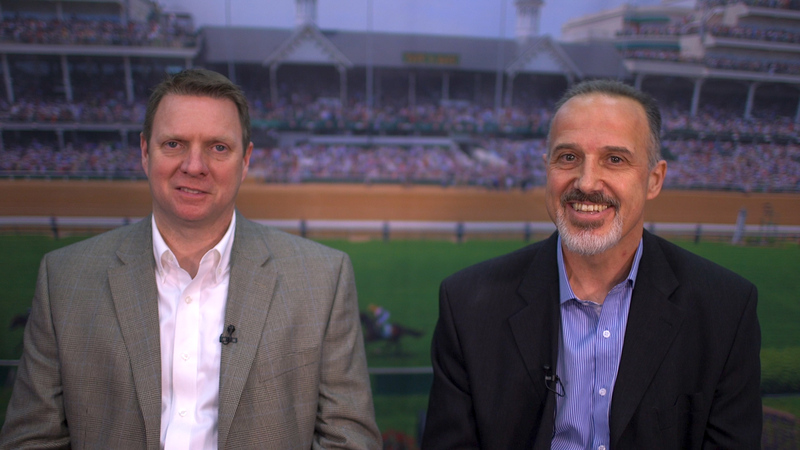 Packaging and label production is often seen as an impenetrable world, but that doesn’t need to be the case, as the CPP Expo showed. Thursday through Friday was the Sign Expo itself. 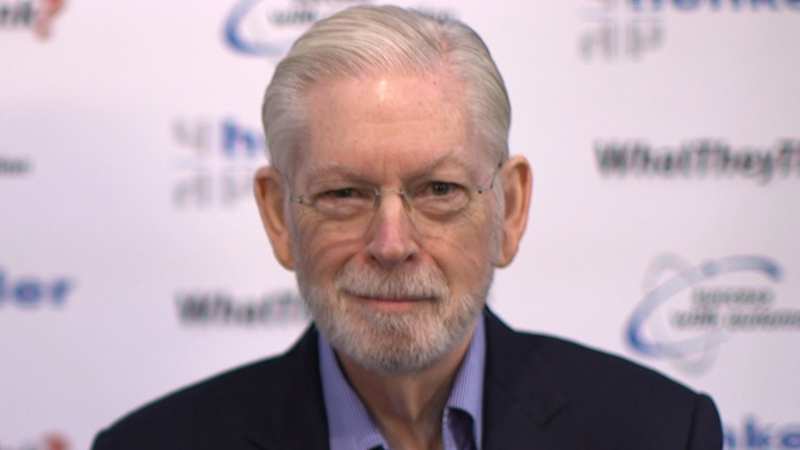 We inevitably speak of attendance at shows like ISA breaking records—such that I think I’m starting to sound like a broken record—but the fact remains that these shows are drawing a tremendous number of people to both the show floor and educational sessions. And, likewise, they are attracting large numbers of exhibitors. Waiting lists have become a common occurrence. “We had more [exhibitors] who wanted to be here than actually were here,” said Jeff Young, Chairman of the Board of ISA. Major product announcements have also become de rigueur at the Sign Expo. Agfa had dipped its toe in the water of textile printing back in 2013, but was a little ahead of the market, and the Ardeco soft signage printer was discontinued not long afterward, which was rather a shame. But, they and the market have moved in sync, and at Sign Expo Agfa launched its Avinci DX3200 3.2-meter direct-to-fabric dye-sublimation soft signage printer. Agfa was also showing its recently announced Jeti Ceres RTR 3200 LED UV printer. The Ceres, a dedicated roll-to-roll device, joins its siblings the hybrid Mira and Tauro lines. The Ceres can print on single- and dual-roll media, and offers CMYK plus white and primer ink options. Avery Dennison Graphics Solutions is endeavoring to reduce its reliance on PVC in its vinyl films, and to that end has launched the new PVC-free digitally printable film, MPI 3901, which the company says does not sacrifice color, printability, or performance in order to be cost-effective as well as more environmentally sustainable. The company’s booth at the Sign Expo was in a state of constant change, as surfaces were wrapped, unwrapped, and rewrapped to create different environments as the show progressed. This was in the service of showcasing new entries in the Supreme Wrapping Film portfolio: eight new colors in a satin finish, and a gloss finish option, for the ColorFlow series, as well as a new iridescent color called Lightning Ridge that shifts from green to purple. Avery’s Supreme Wrapping Film portfolio includes more than 100 colors and finishes for car wraps. 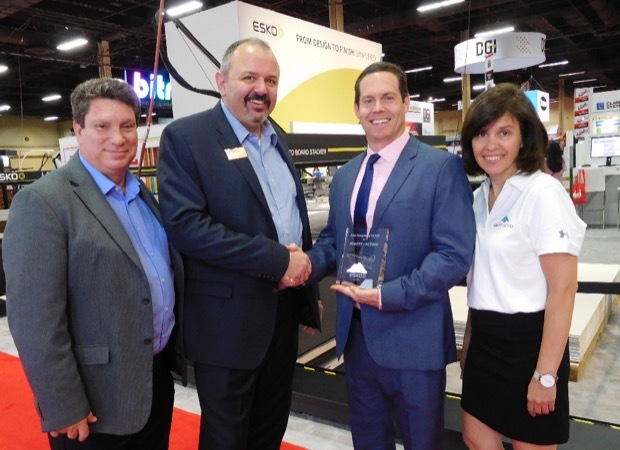 Canon Solutions America (CSA) was showing its Arizona line of flatbed wide-format printers, but the real action was in the presentation area where the new UVgel-based Océ Colorado 1640 printer made its public debut after being unveiled to the press in March. Demos of the Colorado were often standing room only. CET Color was showing the latest addition to its K2 line of wide-format printers, the superwide roll-to-roll UV printer, capable of speeds up to 1,000 square feet per hour. The 3200 is the first dedicated roll-to-roll machine in CET’s K2 line, which comprises hybrid flatbed/roll-to-roll devices. Another debut at the Sign Expo was CET’s Rainier transfer-based dye-sublimation printer. CET was also showing its popular 64-inch Q5-250h, a hybrid model designed as an entry-level device for companies that want to get into signage and are unfamiliar with flatbed machines. You may recall that EFI launched a couple of new printers back in January, but at the Sign Expo they launched two new wide-format machines. The EFI Pro 16h is a follow-up to the successful entry-level H1625. The new 16h is a 65-inch LED UV hybrid flatbed/roll-to-roll printer designed to be an affordable entry-level unit for wide-format printing. Also making its debut at the Sign Expo was the sister unit to the VUTEk 5r that was launched in January—the VUTEk 3r, a 3-meter LED roll-to-roll printer, which also includes such other options as an inline x-cutting, slitting, and collecting. The 3r also features advanced white printing modes. Ceci n’est pas cuir; this faux textured leather banner was printed on an EFI VUTEk LX3Pro. No cows were harmed in the making of this banner. Esko was in a celebratory mood, and the champagne corks were a-poppin’ as the company marked the 10,000th Kongsberg cutting table sold, specifically to Abbott-Action, a producer of corrugated display systems, which purchased two Kongsberg tables for its Attleboro, Mass., facility. The new tables feature the new Esko iBF feeder and iMS material stacking systems, part of the Kongsberg Automate solution. Esko Celebrates Abbott-Action having purchased the 10,000th Kongsberg cutting table. (L–r) Bill McDonough, Esko; Daniel Sparrow, Esko; Sam Abbott, Abbott-Action; Gail Conca, Abbott-Action. 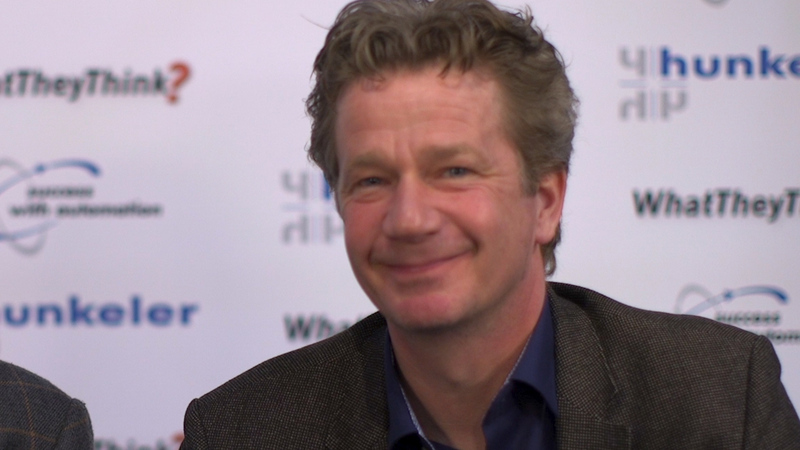 Over the past couple of years, HP has used the Sign Expo as an opportunity to launch new products in its Latex line of wide-format printers, and on Thursday, it announced a new Latex-based print-and-cut solution which comprised the 54-inch Latex 315 and 64-inch Latex 335. These are integrated printers and x-y cutters that are driven by the HP FlexiPRINT and CUT workflow software, and also come with the HP Signage Suite, a design platform that allows printers to design and print signs, banners, industrial posters, rollups, even T-shirts, using a template-driven interface. The vinyl frontier; on Throwback Thursday, perhaps, HP’s booth featured old LP spines. The protruding “records” actually had textured grooves printed on an HP Scitex flatbed. 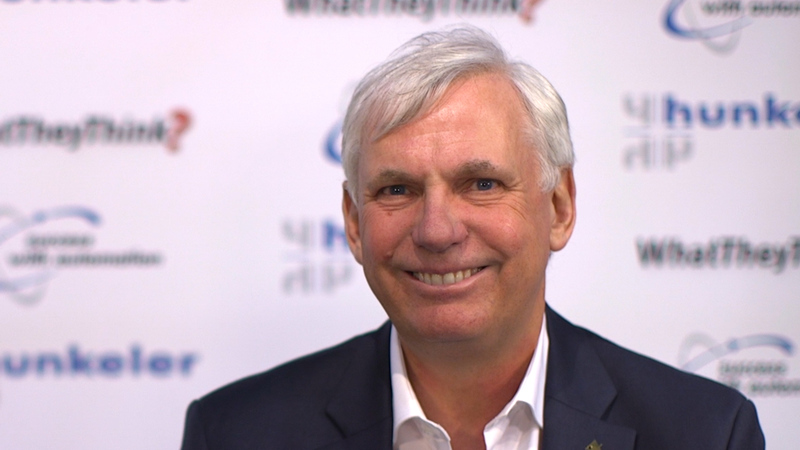 For a company that has really only been active in the industry since drupa less than a year ago, Massivit has made some very strong inroads thus far. The company was showcasing its Massivit 1800 3D printing unit, based on the company’s Gel Dispensing Printing technology (GDP). The Massivit 1800 can print objects up to five feet nine inches tall, four feet nine inches wide, and three feet nine inches deep at a quoted speed of the 1800 is about 14 inches an hour (your mileage will vary). The size of the bed also allows dual-object printing (optional). According to the company, about 70 percent of its customers thus far are in sign and display, with the remaining 30 percent or so being ad agencies. 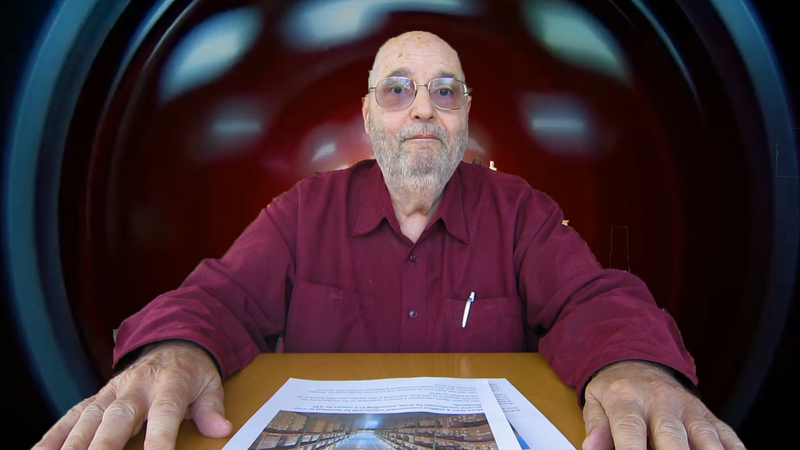 There have also been a sprinkling of “3D service bureaus” cropping up, and the machine has made some inroads as a way to produce props for theatrical productions, and Hollywood may soon come calling. The technology is still in the “early adopter” phase, and indeed, Massivit Product Manager Sharon Rothschild, who had been with Indigo at the dawn of digital printing, told me she feels the same excitement now that everyone had felt when digital printing was new and about to change the world. 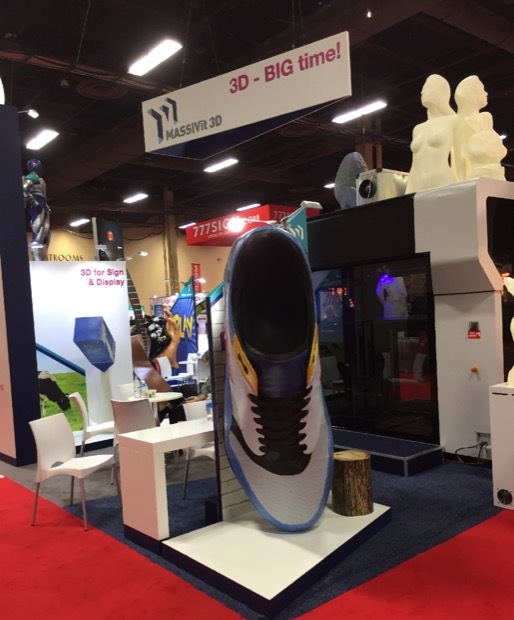 Some big shoes to fill; Massivit’s 3D printing can be complemented by hand-painting, spray painting, or even 2D printed applications. 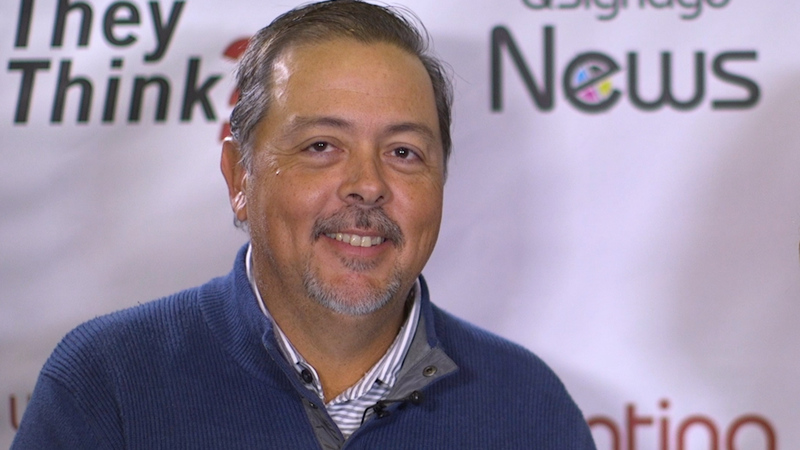 Mimaki was touting what it was calling the “Microfactory,” the idea that with today’s equipment, signmakers can offer many many different kinds of printed products than just signs. Essentially, by leveraging digital printing and cutting, different types of inks, and complementary technologies from third-party vendors, signmakers (or print service providers) can tap into what is believed to be a growing on-demand manufacturing market. 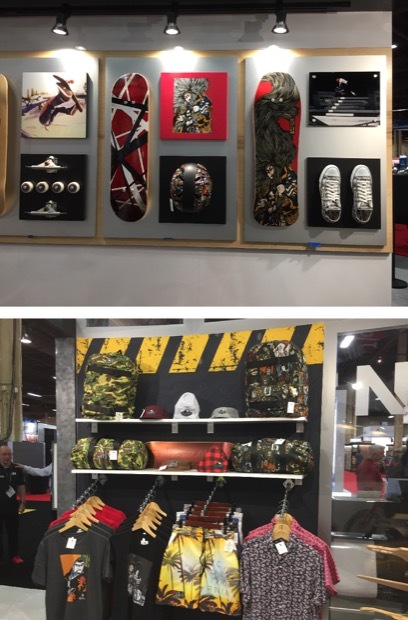 The Microfactory example that Mimaki was using at the show was a theoretical sporting goods manufacturer, which could produce personalized gear such as helmets, cycling apparel, and skateboards along with things like shirts and other apparel. Mimaki has a long history in textile printing, and has been previewing and launching new dye-sub printers—both transfer and direct-to-fabric—regularly. To wit, the company launched the 3.2-meter X500P-3200DS digital fabric printing system, a direct-to-fabric dye-sublimation machine with built-in calendering. It is designed for soft signage, exhibit graphics, and décor applications. Mimaki also launched the 74-inch wide TX300P-1800B direct-to-fabric textile printer, designed for users creating samples or short-run pieces. Mimaki was also showing a unique “dual-ink technology” feature of its TX300P textile printer. Since the machine uses four printheads, it can assign two heads to use a dye-sublimation ink and the other two to use pigment inks. This allows users to print on a wide variety of synthetic and natural fabrics using the same machine. Mimaki was also demonstrating a prototype 3D printer whose output needed to be seen to be believed. Last month, Roland launched the latest units in its CAMM-1 line of vinyl cutters, the GR-640, 540, and 420. Improvements include speed, downward force to cut through thicker materials, and a dual-position tool carriage that eases the transition from kiss-cutting to perforating. The GR series cutters can read crop marks generated by popular industry software, allowing the cutters to be paired with many existing wide-format printers. For the past couple of shows, Roland had been demonstrating progressive beta versions of its content generation software, and at the Sign Expo it was finally announced: the InClix Creative Media Maker is now launched. It is a web-based tool for sign professionals that offers an integrated design and workflow management system, as well as quick access to design templates as well as royalty-free stock content. InClix also offers a community environment, where users can even create and sell their own content or templates to other InClix community members. SAi was celebrating the 25th anniversary of Flexi, the sign industry’s standard design tool, boasting one million licenses, 72,000+ users in 100+ countries, and 7,500 subscribers (there is now a cloud version). The latest in Flexi news is a mobile app called MyFlexi that provides print and sign shop employees with various tools to improve throughput and production time. The killer app, so to speak, of MyFlexi is remote access to FlexiQuote, SAi’s web-based estimator that allows sign and print businesses to quickly create customer quotes on-the-fly. Other features include bar and QR code readers, training videos, and more. Cutting is becoming more conspicuous, and Summa has had a substantial footprint in Europe with its x-y cutters and cutting tables, and is now starting to ramp up its U.S. operations and stateside presence, as well as forge dealer relationships. The company offers a full line of cutting options, from the entry-level SummaCut and higher-end S2 series of vinyl cutters, up to the 63-inch entry-level F1612 cutting table up to the whopping great 104-inch F2630 table. The cutting tables offer a full range of tools, from simple dragknives, to tangential knives if you need more force, to routers, and so on. Throne for a loss: today’s cutting tables can produce intricate detail. Next year’s ISA Sign Expo 2018 moves back east and will be held March 22-24, at the Orlando County Convention Center in Orlando, Fla.